You might think “Why would I want to turn my light into a computer?” I was thinking that, too, until I saw what the folks at Beam Labs are up to. This is a ingenious bulb that has a full Android OS inside. Simply screw in the Edison bulb, turn it on and use the lamp as a projector. The first application I thought of was for a restaurant. You could easily have a menu project onto a table. When you don’t want to see the menu anymore, flip the switch and it’s a regular light bulb. With the app, you could also turn that menu-light into an Internet Connected game system or video watching system. While the family waits for breakfast, they could be watching the latest news projected on the table from the overhead lamp. 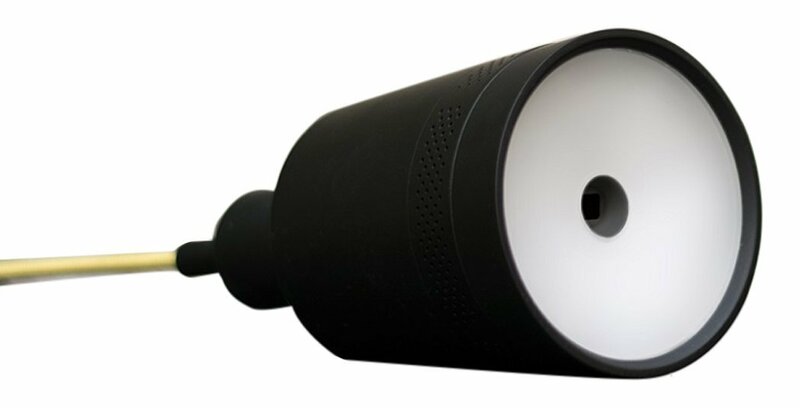 Most portable lamps could be converted to smart lamps by switching out the bulb. Forgo the lamp and take a small can light with you to show off your presentation to the public. The lamp projects 100 Lumen, 854×480 screen in 24 LED lights for over 20,000 projection hours. Add to it the 2×2 Watt speakers to hear your videos and games. The device inside is a 1.3 GHz dual-core processor with 8 GB of storage. The device can connect to Wifi and Bluetooth devices. Beam is available now for $455 per unit.